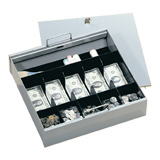 Our cash trays are made of heavy gauge steel with double sided wall construction. Tray can hold five coin, five currency and has one 14 7/8 x 3 1/4 utility compartment. Choose from 3 colors, with or without a locking cover. Size: 15 1/16 x 15 x 3 1/2. Priced each.